Elaine Hancock (Olney, United States) on 11 August 2012 in Art & Design. Sculpture at a park in Baltimore. What a great character - it really stands out against that wooden framework. Dans la petite cabane en bois quel belle image marrante génaile. Une création originale cette sculpture, merci de nous la faire découvrir. A very nice find! I like this modern sculpture, it's funny. Your composition is beautiful! Very innovative in design and colorful too! 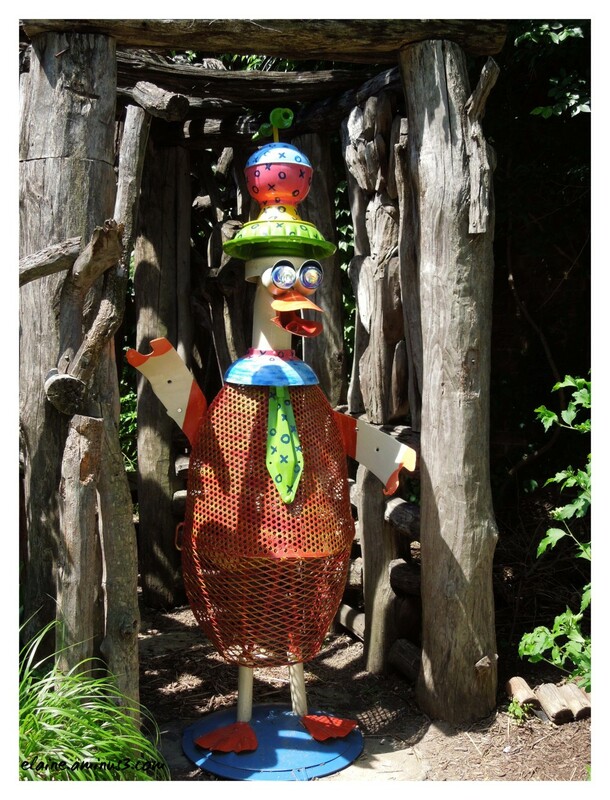 A great find Elaine, his wooden surroundings make a nice setting for this zany duck. The pop of green on each side matches his outfit too, he's a cool dude!! :) Super comp, color and detail...... I love it!! Lol, funny and nice shot. Colorful and funny, cute find ! What a colorful character for the park. A funny and very successful creation by someone. I would have saved this for ST! LOL! I love it! I like the colors and the graphic of the textures and shapes. The angle of your image is superb. @Ruthiebear: You are right! I should have saved it. I didn't even think about it. Would have been a great Silly Tuesday. :) Great color and I like the way the wood frames her. @Bruce: I didn't even think about ST. I need to get with it more! Oh I LOVE this :-) Looks like me....Miss blabbing with you, buddy. Maybe one more week and I might be able to get back on more than I am right now..I hate working. @Denny Jump Photo: I know, I miss talking to you also! I don't miss work one bit so I understand! Very unique and colorful duck; great find! C'est génial, j'aime beaucoup et bravo, ta photo est belle !